I made this drawing in the mid-90s when I illustrated The Birds of Yakima County, Washington for Andy Stepniewski. 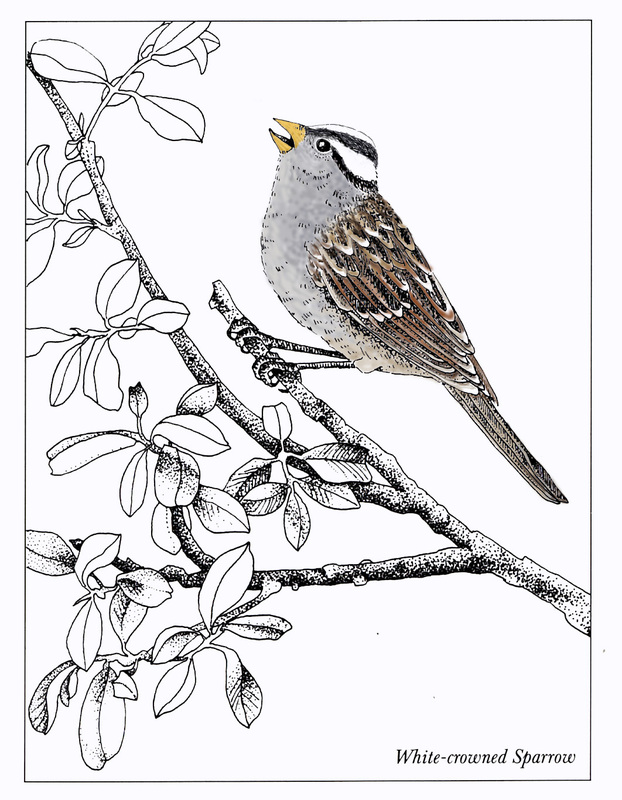 I was thinking about it because the white-crowned sparrows are back, and I hear them calling and calling. Sometimes they come to the bird feeder in my garden. I’m really fond of them–their song means that spring is really here. They will move higher into the mountains when the snow melts, and I’ll hear them out there. I was tempted to print the drawing on watercolor paper and color it by hand, but printer inks run when they get wet. So I tried Photoshop. I ended up re-working the bird’s head, and fiddling around with colors. It was tedious enough that I decided I didn’t want to color the leaves or background. For me, painting digitally is not nearly as much fun as actual painting. Much less swearing involved if I paint with real brushes. Rainstorm coming after a nice day yesterday. I was out in my reclining lawn chair like a 19th century convalescent, quilt ready if I needed it. I got a tiny bit of sunburn where my pants got pulled above my sock and pale flesh was exposed. Today is cloudy and the air is still. About three cherry blossoms are open on my tree, and the male rufous hummingbirds are zinging around.